The Board of Elections is a bipartisan office comprised of two appointed Commissioners representing the state’s major political parties, and equal party representation in all facets of the Board. The Coroner’s Office makes inquiry into all deaths within the county that are unattended or violent in nature as prescribed by law, Article 17-A Sections 670-678. The County Attorney represents the County in all legal matters and serves as legal counsel for the Legislature and all County Departments. The County Clerk's office is responsible for recording Deeds, Mortgages and other real property related documents within the County, and is the clerk for the Supreme and County Courts. The District Attorney represents the citizens of Tioga County and the People of the State of New York in the prosecution of all vehicle, traffic and criminal offenses committed within the County. The Office of Emergency Services provides and/or supports the the volunteer fire departments and emergency squad/first responder units in Tioga County. The Historian's office provides information and services to the public and historical organizations, and maintains an extensive on-site resource library and historical compilations that relate to all aspects of the history of Tioga County, New York. Information Technology and Communication Services (ITCS) manages all data, telecommunications, and web services, providing technical support to all County departments. The Legislature is the elected body representing the people of the County in all County business and is supported by the Legislative Clerk's office, which provides agendas, minutes, and other important information to the public. The Mental Hygiene department protects and promotes the psychological well being of the citizens of County through programs and services to residents. The Tioga County Department of Personnel, under the direction of the Personnel Officer, administers the provisions of the New York State Civil Service Law for the 24 County departments and more than 20 jurisdictions (towns, villages, schools and special districts). The Public Defender's office provides adequate legal representation to indigent defendants in criminal cases within Tioga County. The Tioga County Health Department is responsible for health promotion, disease prevention and community needs assessment. The Public Works department maintains roadways, buildings, bridges, and other infrastructure throughout Tioga County. The Real Property office is a liaison between State and Local government for administration and understanding of Real Property taxes within the County. The Sheriff's Office provides law enforcement services within the borders of the County and manages the County Jail. Social Services promotes self-sufficiency and protects citizens by providing financial and social services to eligible County residents through program development, application of the law and encouragement of responsibility in an empathetic, timely and customer focused manner. 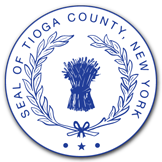 The Tioga County Treasurer is an elected official and serves a four year term and serves as the Chief Fiscal Officer, Investment Officer, and Tax Enforcement Officer for the County. The Veterans' Service Agency provides assistance and support for eligible County residents in obtaining Federal and State benefits which may be available to them. The Foster Care & Adoption office provides assistance to County residents seeking information or assistance with becoming a foster parent or adopting a child. The Industrial Development Agency is a public benefit corporation allowed by State law to promote economic development in the County through the use of financial incentives for private entities. The Motor Vehicles office issues driver permits and licenses to both regular and commercial drivers, and handles licensing matters for a variety of types of vehicles. The Tioga County Property Development Corporation, a New York Land Bank, was established to foster economic and community development by acquiring, holding, managing, developing and marketing distressed, vacant, abandoned, tax foreclosed and under-utilized residential and commercial properties. The Recycling program encourages the diversion of recyclable waste from landfills to recycling centers and manages the County-wide curbside recycling program. The Soil and Water Conservation District handles planning and management of water and land use throughout the County. The Coalition’s mission is to connect those touched by suicide to helpful resources, increase public awareness about suicide and effective prevention, and to provide education, training resources and coordinated community services to the public. Tioga Investigates Natural Gas (TING) was formed to help the County prepare for and assess the potential public impacts and opportunities related to natural gas drilling. The Tioga Career Center provides employment services to businesses and individuals in the County. The Youth Bureau promotes the physical, emotional, and social well being of youth in the community through funding, activities, and coordination with other entities.